When my boyfriend closed on his house, the sellers warned him that stray animals tend to show up here. He thought they were joking. The parade of lost animals started with a pair of little white dogs. In the coming years, they were followed by a crazy, menacing mixed breed pair; mother and daughter Labradors; a carrier pigeon; and a miniature schnauzer. 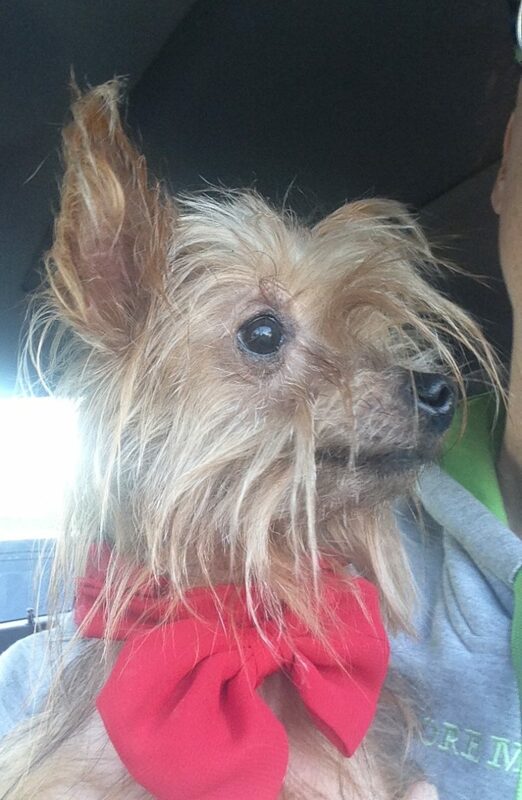 Last week, on Byron’s way to work, a little lost Yorkie ran under his pickup truck. This was near a busy road, so he got out and picked up the dog. Next thing I knew, I was driving the Yorkie to the vet. She was only wearing a bow, and where she wasn’t balding, her fur was matted. I was really pumped when the microchip scanner alerted and then was equally dejected when the vet’s assistant related that the chip company said the last information they had on the dog was from 10 years ago in Miami. Things got wild from there. I received a call from Yajaira, the original owner in Miami. She was shocked that Ginger was in Texas. I was shocked that the dog had been missing for so long and no one else had brought her to a vet for a check. I immediately updated the quick post I had placed on a local lost-and-found pets Facebook page. Most people liked that the update announced the owner was located with a microchip. Of course, a busybody piped up that I should track down whoever had her in Texas and let that person sort out ownership with the Miami lady. I fumed. Really? The Miami lady had the dog’s original papers and had her animal chipped. Whoever had Ginger in the meantime had not been kind in terms of keeping up with medical care. Perhaps they were well-intentioned, or perhaps they dumped her. All I knew was no one appeared to be looking for her, either online or with neighborhood signs. Most importantly, her legitimate owner was flipping out and planning to bring her home to Miami. That was such a refreshing contrast with the original owner of the schnauzer that showed up in our driveway in 2014. Byron tracked down the person from an old rabies tag on that dog. The guy said he had not seen the dog in two months and ultimately did not want the dog back. He suggested Byron drop it off at the pound. We kept that dog in the family and Roscoe now happily lives with Byron’s parents. Here, with the little lost Yorkie, we had the original owner on the line, overjoyed to hear her dog was located, 10 years later. We also had a little logistical crunch in that Byron and I had immediate travel plans. We had been selected by lottery by Texas Parks and Wildlife for a management hunt, which is a means of controlling against deer overpopulation. We had already paid for our permits and had reservations to camp. I suggested that Ginger be kenneled with our dogs at the vet’s office and she could be examined as well. We’d be back in a couple of days. This ultimately worked out fine, especially as her Miami owner wanted her condition checked out, and the plan was to bring Ginger to the airport on Saturday. We were all so excited. Driving to the airport with Ginger on my lap, I got a sense something might be wrong. Then again, we were listening to David Bowie’s last album and the ominous tone of the music was giving me a bad vibe. Well, maybe I had a premonition because when we got to unnamed airline’s cargo office at the appointed time on the airbill, the door was locked. A man’s voice expressed indifference to our plight. We begged the terminal staff for assistance and they earnestly cared, but could not override the system to let a cargo dog fly in the passenger cabin without an accompanying passenger. Yajaira and I had been madly texting each other as she was on the phone with the airline. Ultimately, the reality dawned that Ginger wasn’t getting on a plane to Miami that night. We resolved to regroup and try Sunday morning with United Airlines. What a world of difference. When we got to the designated area at the United cargo office, there was a van with photos of doggies. 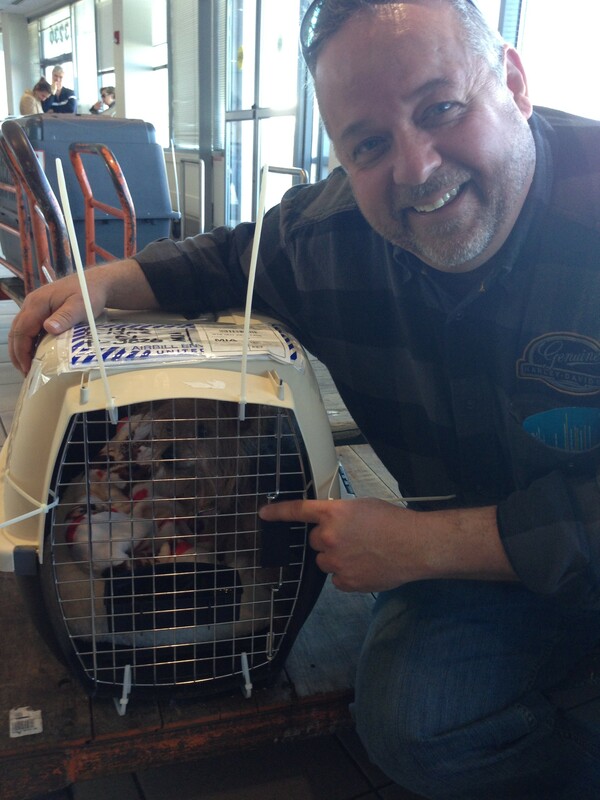 We walked in and were warmly greeted by an amazing, dedicated United PetSafe staff. The counter lady said at the outset that she would do everything to make sure Ginger made her flight. She was not kidding. We had the wrong kind of crate and Byron set out to a store to get the right one. He came back with the wrong size. The lady found a spare and gave it to Ginger (after first checking with the person who had left that crate behind). She took care of all the paperwork and made sure Ginger was safe and secure. It was time to say good-bye to Ginger. I could not celebrate yet because I wanted to wait until I knew she was back with Yajaira. I set up a flight status alert with the United app. Finally, we received a photo text with Ginger and Yajaira in Miami. That was the ultimate relief. 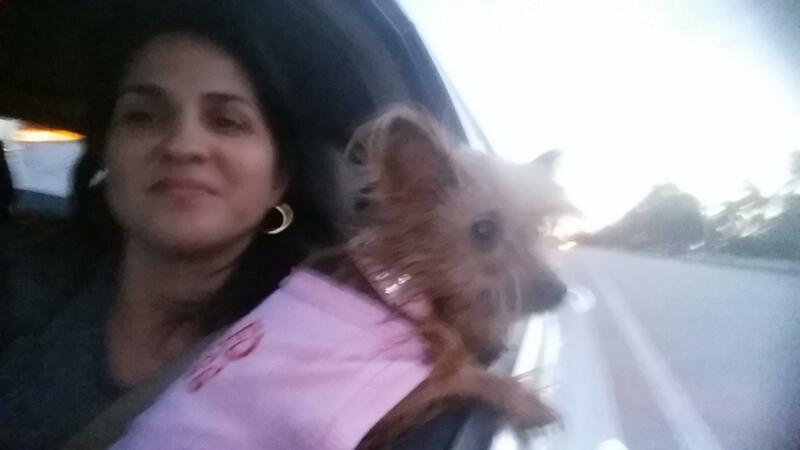 We received multiple photos and videos of Ginger back at her Miami home. Yajaira said the dog just walked right back into the house. That doesn’t surprise me at all. Ginger is a very smart dog and knows where she is truly loved. So happy that Ginger finally got back home after all these years…this is such an amazing story. Thank God you are still in the same place…. She’s doing much better. Her owner has been keeping us posted with notes and pictures. When she got to the house, she just walked in as if she remembered her Miami home, even after all those years. She is on medication and her health is improving. She is best friends with one of their other small dogs. She follows her original owner everywhere. Just a fabulous story!!! Thank you so much for what you and your husband do! I hope your example will inspire more people to care! What a lovely story and a happy ending. Great. You had me until the managed hunt. I understand. Still, the purpose of such a hunt is to address overpopulation. These hunts are held selectively and judiciously for wildlife management. I was introduced to hunting after moving to Texas and prefer to know exactly where the meat comes from, as opposed to the supermarket stuff. please don’t drive w your dog on your lap like that with window wide open ! as vet tech I have heard and seen it all ! accidents of all kinds happen , you just got her back – what if someone smashed into you and you did not do one thing wrong ? who would suffer . This was one of a series of pictures at the airport in Miami of Ginger being reunited with her family. Perhaps there was a moment of exuberance captured here. From personal experience, I can tell you Ginger, who is tiny, crawled from where I thought I had her in a safe space to my lap when I had driven her to my vet’s office for the microchip scan. She is very good in a crate too! I can also tell you her owner has put tremendous care into nursing the dog back to health. She just had surgery to remove five tumors from her chest as well as oral surgery. Maybe the dog was on her lap for a picture. I would let my dog do the same thing for a few minutes while driving too. Followed a thread and found this INSPIRING saga and tears ensued from the moment she sought safety under Byron’s truck. Ginger KNEW a ‘ person -KIND’ was nearby and [her ] PRESENT [from k-9 heaven ‘guide’ dogs”L L C” – love light canines ] Kudos to you both For ALL you DO, Have DONE, and will Continue to SHARE from your sentient-KIND LOVE – LIGHT HEARTS. Namaste’ …”For Planet, PETS, and people” plus prophet’s path. Amazing and very happy story……I can see why Ginger follows her owner….she doesn’t want to be parted from her ever again. This had me crying so hard? I’m so happy for all involved God bless u all?